Shut the Samurai Up and Give Up! 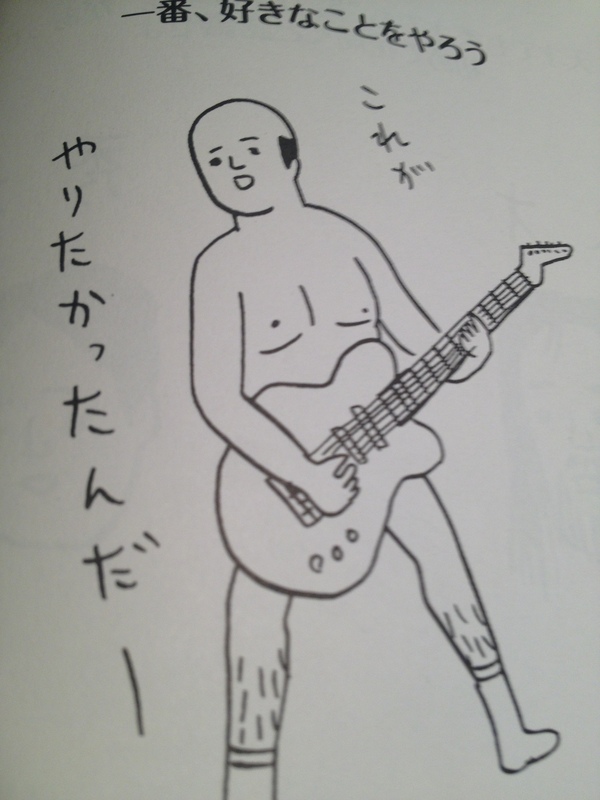 This image is from a great book in Japanese that translates into 100 Tricks to Get Better at Guitar. It has a lot of practical practice tips and also tips that I think could apply to life beyond guitar. One of the tips is whatever you do have fun and also do it your way. STSU, give up, and do it! I’ve practiced more guitar lately because I have given up. I’ve given up on becoming great. I’ve given up on having to know everything instantly. However, I know that I am not so helpless that I can’t find five minutes. Sometimes I start five minutes, make connections and the fatigue fades away. Or not. However, no one can take those five minutes away. Yesterday’s five minutes connects with yesterday’s five minutes. Or not. A little breath feeds the fire, keeping the mind and heart a little more awake for today and the next day. Or not. The method uses contemplation cards and exercises to help the student tame the geometry of the fretboard and develop a strong sense of relative pitch. This innovative teaching approach was praised by cognitive psychologist Gary Marcus in his new book about music and the science of learning, “Guitar Zero“. I love the beautiful red box they come in and the gorgeous pictures. Will the vitamins work? I don’t know. I just started. But I like the idea of a new way to help mix fun, theory, and the senses. Part of what was stopping me was panicking about the right methods, books, etc. Did I have the right books? Am I doing the right lessons? Am I having the right kind of fun? I decided to “Shut the Samurai Up”, push just a little bit and when I’m finished pushing, noodle around on the guitar. I picked a theory book to push on for five minutes a day. I put the Jamplay lessons on surusu electronic flashcards with links to the lessons, so thinking about which lessons to review will be less of a drama queen moment. I’ve decided to shut the samurai up, give up and try anyway. “Freedom’s just another word for nothing left to lose.” Or not. I stumbled across this post at AJATT and it was just what I needed. the past few days my guitar practice has dwindled form 10-15 minutes down to nothing. I have trouble letting go too and while I've been able to do it in other parts of my life, guitar hasn't yet been one of them. I'm really glad I found your blog! Great! Don't forget to have fun along the way!